Each night of the conference we will netcast video we've taken during the day. 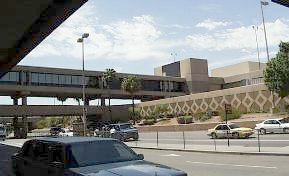 Pheonix Airport Today at the Conference. . .We started our trip in high green summer on the East coast and landed in the arid desert of Phoenix, Arizona. It was 112°F when we arrived in early afternoon. By the time we had driven the 140 miles and 7,000 feet altitude to Flagstaff it was a comfortable 86°F. We missed the opening ceremonies and had video camera failures in BOTH cameras, but the evening air was wonderful and the demonstration by________ and _________ was entertaining. So we will try again tomarrow. . . I DID manage to get a dozen or so digital photos that I'm posting at 6:00 am (what sleep). Review of this beautiful new book. Come meet the author at ABANA 2000! What does they public think? Well, Norm Larson sold out the 60 copies he took to Flagstaff in the first few hours! 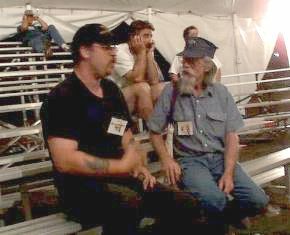 Bruce Wallace and Daryl Meier discussing Nazel Pneumatic hammers as Wednesday evening winds down. By now the weather was perfect and we could have stayed up all night chatting with friends, many of whom we only see every two years. Mark Krause wins JYH Event with Nazel type self contained hammer. Mark is selling a how-to manual from his research into the workings of the Nazel mechanism. Mark works with Toby Hickman. Selected Links2Go Key Resource Each quarter, Links2Go samples millions of web pages to determine which pages are most heavily cited by web pages authors. The most popular pages are downloaded and automatically categorized by topic. At most 50 of the pages related to a topic are selected as "Key Resources."